Paradise Primary school has been delivering quality teaching and learning to students from the local and wider community since its opening in 1978. Staff are focused on achieving the maximum growth for each child through fostering powerful learning and creative problem solving, while developing key dispositions in literacy, numeracy and STEM. Nestled in expansive picturesque grounds the school provides opportunity for all students to succeed and achieve their best in a safe and supportive environment. The school is well resourced and provides flexible learning spaces for students. The local community is supportive and involved in the development of the school. Parent/carer participation is invited and supported through opportunities to engage in classroom support, accompanying children on excursions, attending assemblies and special events, supporting our sporting teams and being on Governing Council. 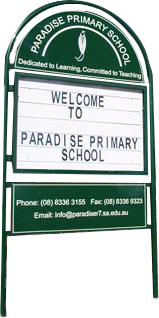 Paradise Primary offers many value added features including SAPSASA sports, Choir, Instrumental Music, Reading Club, Kitchen Garden, Out of School Hours and Vacation Care plus Playgroup. Everyone has a place and an opportunity to shine at Paradise Primary. Book in to a Principal’s tour to find out more about us! Paradise Primary School Community has an unwavering commitment and dedication to quality teaching and independent learning. Dedicated to learning. Commited to excellence.